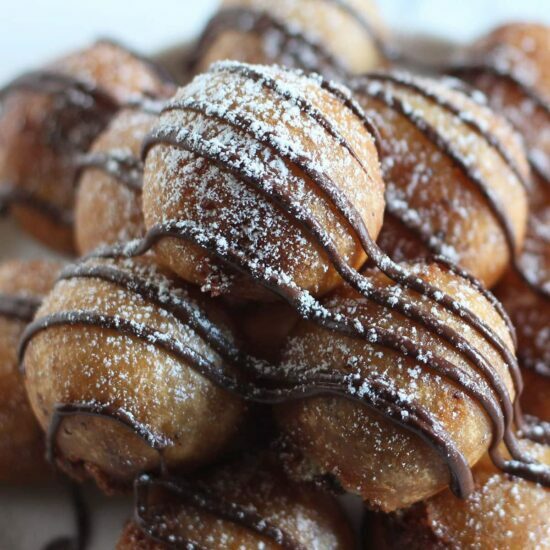 Deep Fried Cookie Dough made with homemade chocolate chip cookie dough, dipped in batter, and fried to golden crispy perfection! Keep reading for the full step-by-step video, tons of tips, and the printable recipe! Taste: Chocolate chip cookie dough PERFECTION. Texture: Super light and crispy batter with an ooey gooey filling. Ease: This is a pretty messy and hands-on recipe, which is why I created the step by step video above to help you see how it’s done! Appearance: They really don’t look like much until they’re drizzled with chocolate and dusted with sugar. Pros: Out of this world decadence. I make this again? Oh yeah. For sure. You might as well call these deep fried balls of HEAVEN. They are pure decadence in the best possible way and I’m so excited to share these with you. Jared and I tackled this recipe together, actually, because deep frying while filming is a balancing act I’d rather not juggle alone. Seeing my expensive camera anywhere near 360°F oil makes my heart skip a beat! It was a fun recipe to conquer together, and we certainly enjoyed the fruits of our labor. 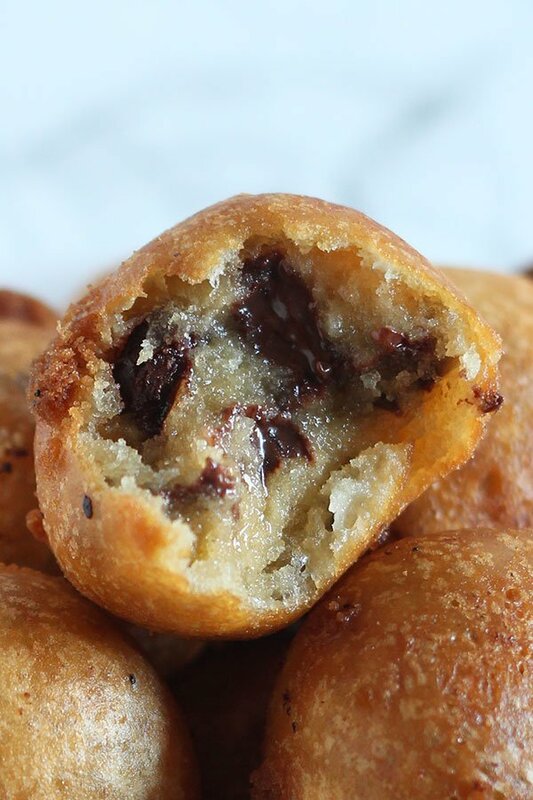 These deep fried cookie dough balls certainly make a bit of a mess but they are so completely worth it! Watch the video below to see exactly how these are made from start to finish! Here’s some extra help and advice in case you think you’ll need it. 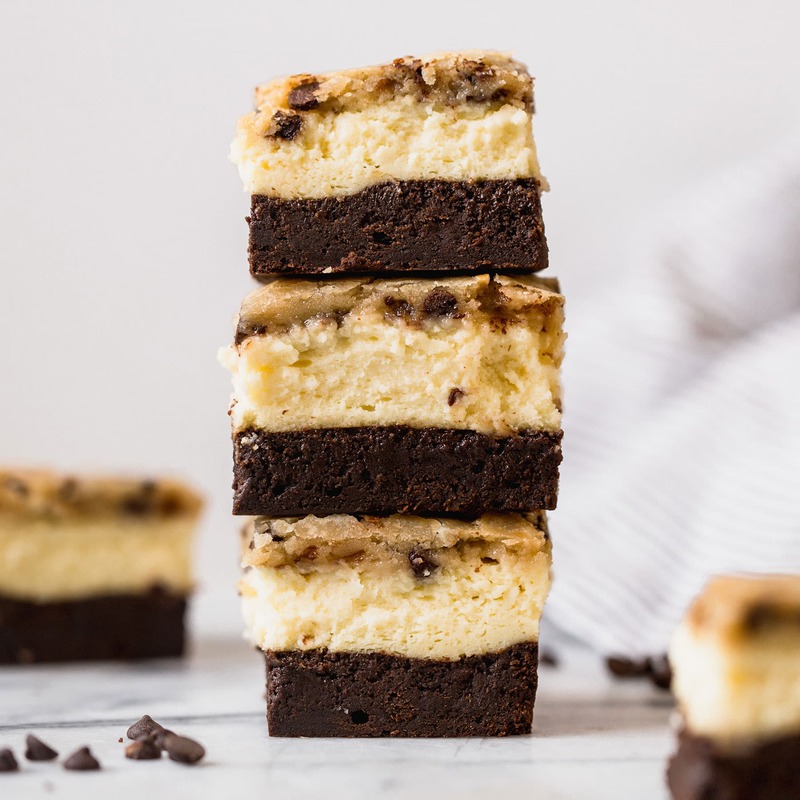 I’ve tried to answer every possible question so you can be wildly successful when you go to make these babies in your own kitchen. As always, feel free to ask any other questions in the comments below! 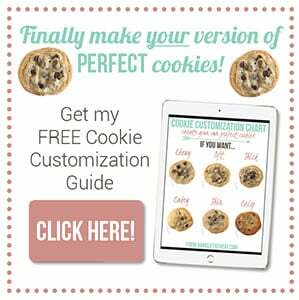 I prefer homemade to store-bought any day of the week, and the cookie dough in this recipe is no exception! If you really wanted to, you could use store-bought cookie dough and proceed with the batter and frying. However, if you are worried about the possibility of consuming undercooked eggs, then I recommend you use pasteurized eggs. The cookie dough in this recipe does not fully cook through. 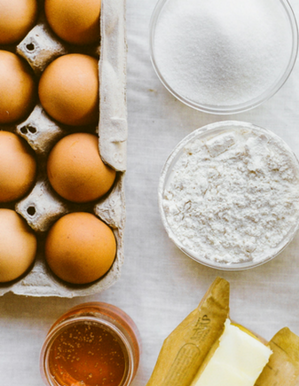 If you can’t find pasteurized eggs, you can omit the egg and replace it with 3 tablespoons of milk. The texture won’t be exactly the same, but I understand it’s a must for some people. Use the batter to fry the cookie dough soon after making it. The batter may look really thin, but I promise it will puff up and offer a nice light yet crispy coating once it’s fried. I used vegetable oil, but any mild oil with a high smoking point will do. I always use a deep fry thermometer to track the temperature of the oil, both for safety and for the best possible taste and texture. Oil that’s too cold will yield a greasy product. Oil that’s too hot will overcook and burn the outside. Bits of batter getting stuck in your oil is pretty much inevitable, so I like to use my mesh skimmer to remove any larger pieces of batter or debris from the oil as I fry. We randomly discovered that one of my chocolate dipping tools worked beautifully for picking up the batter-coated cookie dough and placing it in the hot oil. When we used our hands not only did our fingers pull away the batter, but it’s just not safe to place your hand that close to the oil (even if you see pro chefs do it all the time). Deep frying is already dangerous, no need to risk unnecessary oil burns! We always keep our fire extinguisher out when we deep fry. The balls of cookie dough can be stored in an airtight container in the fridge for up to 2 days before frying. Unfortunately, once these babies are fried they need to be served soon after. They’re not the kind of treat that will stay good for days on end. However, you can keep them warm in a 175°F oven until ready to garnish and serve. In the bowl of an electric mixer, beat the butter, brown sugar, and granulated sugar on medium-high speed until very well combined. Add in the egg and vanilla and beat until combined. On low speed gradually add the flour and salt. Stir in the chocolate chips. In a medium heavy pot, heat 2 inches of oil until it reaches 360°F. Take a chilled ball of cookie dough and dip it in the batter, turning it over with your hands until it’s completely covered. Let excess batter drip back into the bowl, then gently drop it into the oil. Fry up to 4 or 5 balls at a time. Drizzle the balls with melted chocolate and a dusting of powdered sugar before serving warm. These are best served the day they’re fried, but can be kept warm in a 175°F oven until ready to serve. Hey, Tessa! 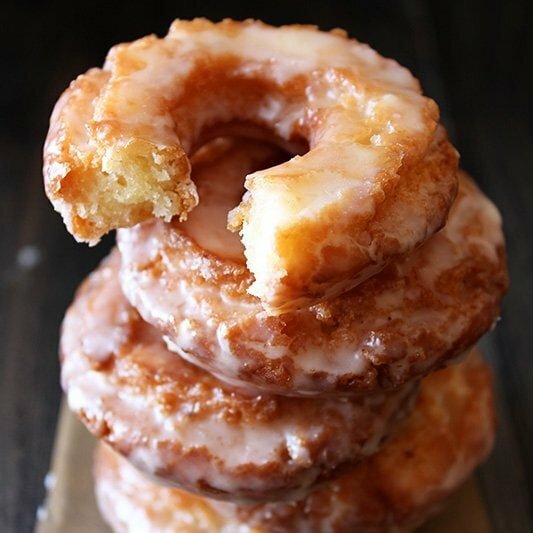 Wow, these look amazing; I wish I could try them right now! Question: do you have to use a deep-fryer? Is there some other thing you can use? Thanks! Oh my goodness…who needs fried oreos when you can have these?!!! I made these tonight and thought they were fabulous! The batter was absolutely PERFECT, nice crunch on the outside and soft of the inside, wonderful flavor! We even threw some double stuffed Oreos in and I wasn’t sure at first how they’d turn out because of the batter not being very thick on it, but those my husband enjoyed more than the cookie dough! I’m imagining if you want a “thicker” batter to stick on something like the Oreos you could just use less milk? I thought it was perfect for the cookie dough though! I want to serve this in my future parties and I just want to know if I can leave it on the buffet table and if it’ll still be good to eat hours after being fried? Well, they’re best served warm so if you can manage that on your table then it should be okay. I had a problem with the batter coming off the cookie dough ball. Any idea why? I tried an Oreo and it stuck just fine. In thinking it has something to do with the temperature of the dough maybe. 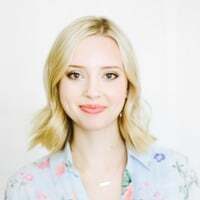 I just recently discovered your blog and I must say it is amazing! 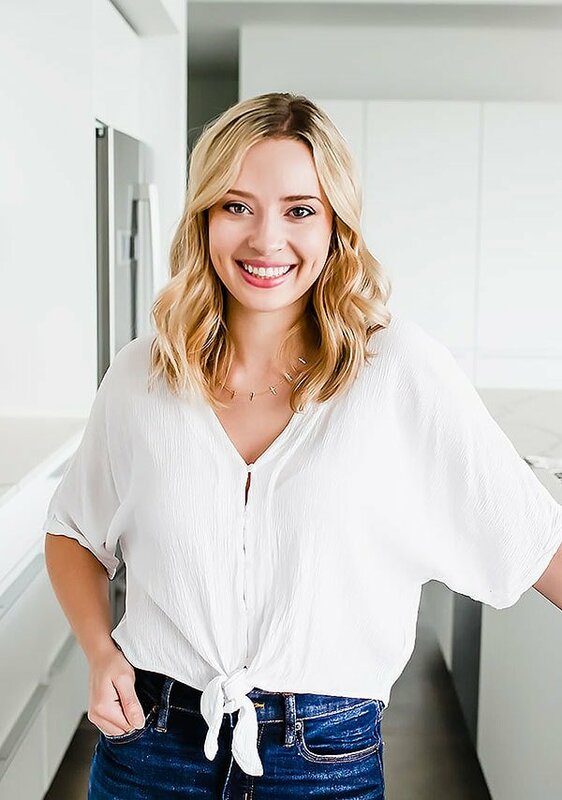 You seem to work so hard to ensure that every ingredient is there for a reason and that is what gives us fool proof recipes, everytime! Thanks for sharing your thoughts and ideas with us! 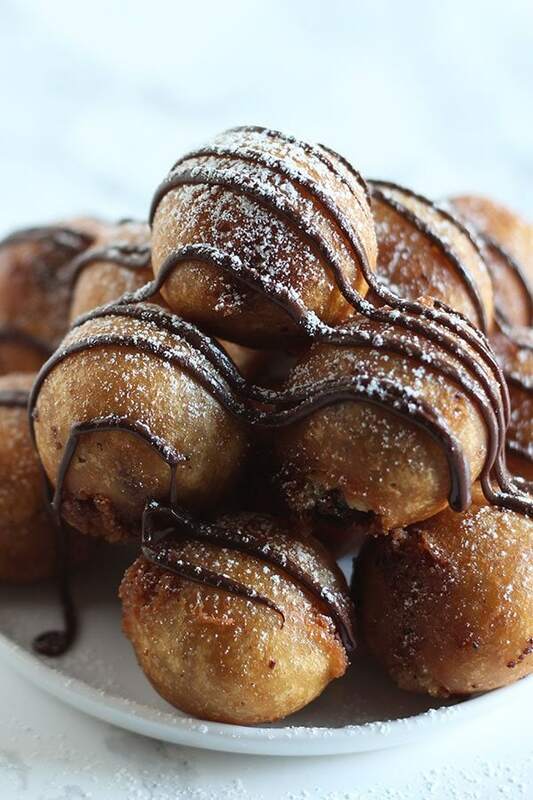 I tried making these deep fried cookie dough balls and they turned out EXACTLY how you said they would! Perfectly golden and crispy on the outside, and ooey gooey on the inside! Question: I have some leftover batter and I was wondering if I could dip oreos in there and fry them? Would they turn out like the deep fried oreos you would find at a carnival? As in, will the batter be soft and cake like or golden and crispy? 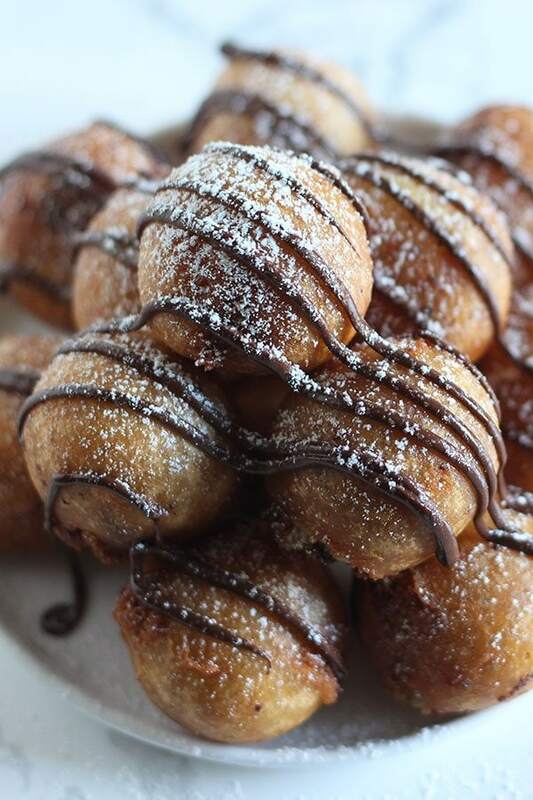 Could you share a fool proof deep fried oreos rexipe with us? I have loads on hand! Wonderful! Love to hear that. I haven’t tried Oreos yet but the batter should work for those too! This looked amazing so I made it tonight. I’m sorry but was so messy and horrible. The batter kept coming off finally I fixed that and then they would fry way too fast. I have a stomach ache from eating them. If the cookie dough is not intended to cook u need to opt out from using egg. Tessa, when ordering the dipping tool, what size do I need. I saw a set of three different tools that come together or you can order just the large dipping tool, all on Amazon. I don’t really know if the large is too big and I need this fast… thank you so much. Tessa, I will also be making thee in mass quantities, any suggestions ? Thanks again..
Can this be baked in the oven instead of fried? I prefer not to fry things. Plus I am scared of frying things as I have been burned by someone frying things. Hi Sara, unfortunately this recipe is formulated to be fried. I understand your fear of frying, I’ve definitely been burned as well! It definitely requires some patience and caution. Have you ever tried frying with frozen balls of cookie dough? 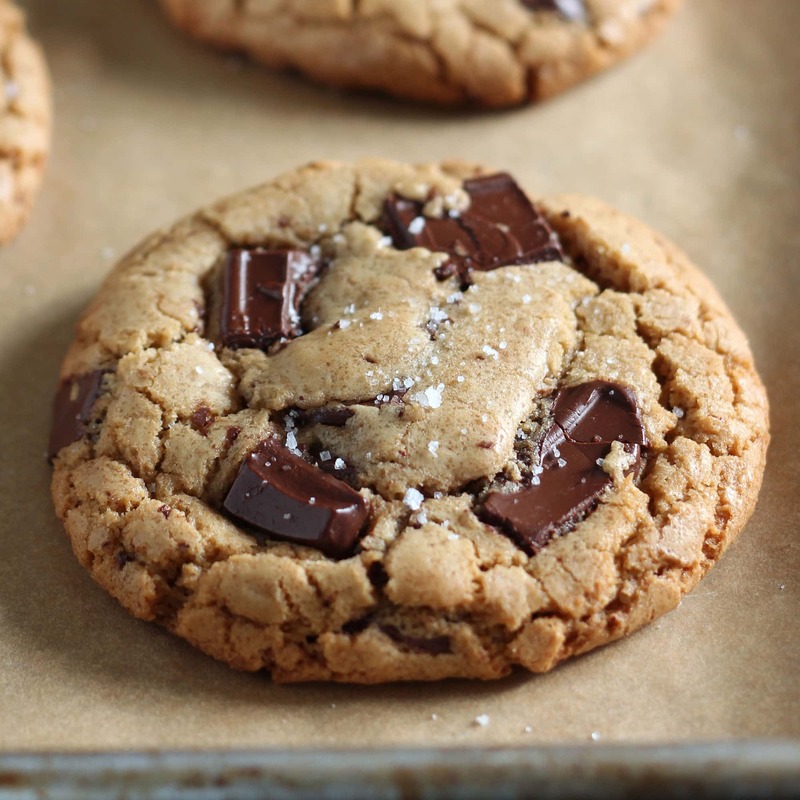 I have some in the deep freeze from peanut butter chocolate chunk cookies I just made, planning to dip them in the batter frozen and fry in my deep fryer, but I’m not sure how long/what temp I should work with.